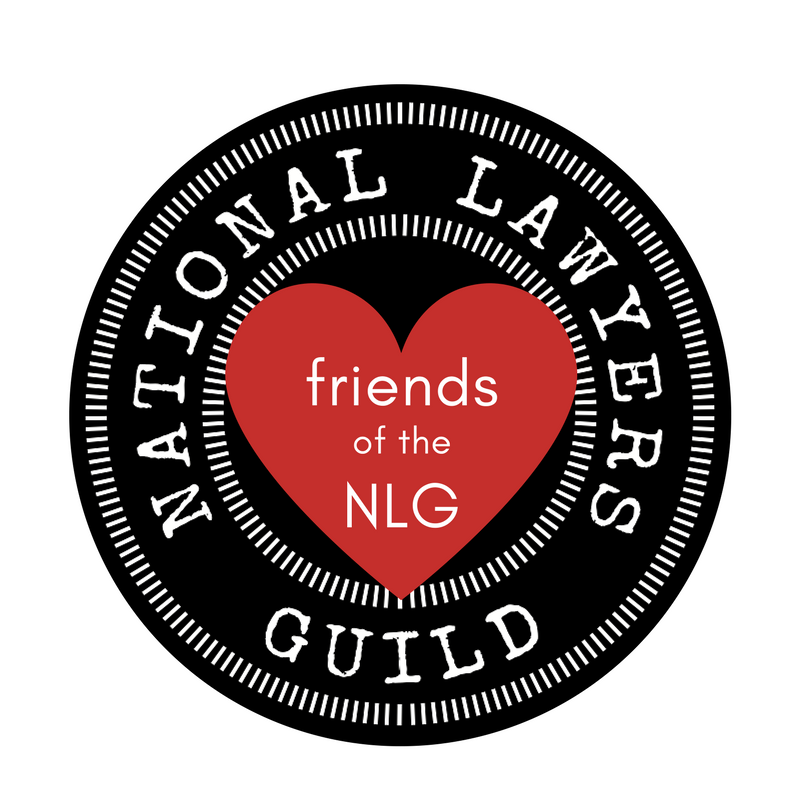 The National Lawyers Guild Foundation is a 501(c)(3) nonprofit corporation that promotes the NLG’s mission through public education and grants to legal projects engaged in the defense of political and civil rights. Since inception, a primary role of the Foundation has been to support the sustainability of the NLG National Office through direct grants on an annual and as-needed basis. These grants allow the National Office to coordinate national mass defense, organize students, provide fellowships, and produce and distribute NLG publications. Our support ensures that the National Office remains a strong uniting force of the Guild. 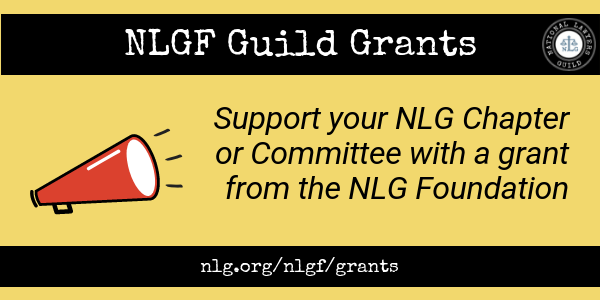 In 2014, the NLGF launched a small grants program to support NLG entities outside of the National Office through small grants to promote membership and strengthen programmatic work between Guild chapters and committees. Past grantees include the NLG NYC Chapter Labor and Employment Committee, the NLG Military Law Task Force, the NLG Philadelphia Chapter, the NLG Louisiana Chapter, CUNY Law Foundation, and the NLG Portland Oregon Chapter. Information about the current grant cycle can be found here. In addition to supporting the National Office, the Foundation serves as fiscal sponsor for NLG chapters and committees that do not have 501(c)(3) status. Fiscal Sponsorship allows NLG entities to seek grants and solicit tax-deductible donations. Past and current fiscal sponsorees include the Committee to Stop FBI Repression, Lynne Stewart Defense Committee, Committee to Save Mumia Abu-Jamal, and the Military Law Task Force. The Foundation has also served as fiscal sponsor for the New York City, Chicago, Detroit, Los Angeles, Portland and San Francisco Bay Area Chapters. Any new projects seeking fiscal sponsorship must have a direct relationship with a Guild chapter or Guild committee. Please contact nlgfoundation@nlg.org for more information. The NLGF relies on the generosity of individuals like you. Your gift will support human rights activists working with the legal system to make direct change for social justice. Gifts of any amount make a huge difference to our work. Making a monthly pledge is an easy way to pledge your commitment to the Guild. Your recurring contributions provide a steady source of support while saving time, fees, and resources. By including the National Lawyers Guild Foundation, Inc. in your will, you can memorialize a lifetime of people’s lawyering and guarantee that your voice for human rights over property interests will carry on. If you are age 70½ or older, you can make tax-free charitable gifts of up to $100,000 per year directly from your IRA to eligible charities, such as the National Lawyers Guild Foundation. Qualified Charitable Distributions satisfy your required minimum distribution while avoiding the potential negative tax consequences that regular IRA withdrawals in retirement can create. The contribution must be made directly from a traditional IRA account by your IRA administrator. Donating IRA assets can be a financially rewarding strategy for both you and the Guild. As always, you should talk with your financial representative or tax adviser before making a decision that alters your tax situation. Contributions must be made directly from a traditional IRA account by your IRA administrator to the National Lawyers Guild Foundation. Gifts must be outright. Distributions to donor-advised funds or life-income arrangements such as charitable remainder trusts and charitable gift annuities do not qualify. Gifts from 401k, 403b, SEP and other plans do not qualify. Ask your financial advisor if it would be right for you to create a traditional IRA account so you can benefit from the IRA Charitable Transfer. Satisfy your required minimum distribution for the year. Avoid taxes on transfers of up to $100,000 annually. Reduce your taxable income, even if you don’t itemize deductions. Make a gift that is not subject to deduction limits on charitable donations. Contact your IRA plan administrator to make a gift from your IRA to the National Lawyers Guild Foundation. Please note that because IRA charitable rollover gifts reduce your taxable income, they do not qualify for a charitable deduction. Please contact nlgfoundation@nlg.org if you wish for your gift to be used for a specific purpose. By naming the Guild as a primary or secondary beneficiary on your life insurance you can support the Guild’s work to advance human and civil rights while ensuring that your loved ones are provided for. Make a contribution to the Guild with stock or mutual fund shares instead of cash and save on capital gains taxes.